Aaron McEneff poses for a photograph with two of his biggest fans, Lennon (7) and Harry (6) Nelis from Derry. AARON McEneff has gone from fans’ favourite to being declared ‘persona non grata’ by supporters of his hometown club, Derry City. And the midfielder’s nonchalant ‘Panenka’ penalty which sent Shamrock Rovers fans into meltdown in the new 2,000 seater south stand in Tallaght simply rubbed salt into the wounds of the travelling City fans. 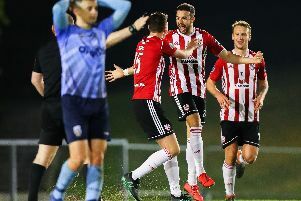 That cheeky chip was hard enough to take as it put the game beyond Derry at 2-0 with little more than 10 minutes to go but it was the way in which McEneff wheeled away in celebrations, mobbed by his teammates and adored by Hoops fans’, which hurt more than the goal itself. If there was any chance of forgiveness for swapping the red and white Candy Stripes for the green and white hoops, then it was wiped out at that very moment. A flick through social media after the game and it’s clear the Cornshell Fields native has become City’s latest pantomime villain. Derry people are normally supportive of their own, just not to the detriment of their own club! He might have antagonised the City support with his applause after an unsavoury confrontation with Jamie McDonagh who was shown red for a rash challenge on Trevor Clarke. However, it has to be said, some of the abuse he was subjected to on Twitter and football forums was out of order but McEneff knows he’ll have to be thick skinned. It is, after all, just a game! Emotions run high after watching your team lose and when it’s one of your own that does the damage it’s particularly galling. McEneff celebrates his first goal for Shamrock Rovers against Derry City in Tallaght last Friday night. Should McEneff have refrained from celebrating his goal and shown more respect to the club which give him his chance in the League of Ireland? In my opinion there’s nothing worse than a sheepish, apologetic celebration when a player scores an important goal against his former club. It was his first goal for his new club, the first scored in front of the new stand which housed the club’s ‘Ultras’ and in front of an attendance of 4,522. It’s the most natural thing in the world to celebrate a goal and it’s not showing disrespect to a previous club’s fans to do so. He probably annoyed City fans when claiming his ‘favourite place to play’ was Tallaght and that he couldn’t wait to play in front of Rovers fans despite the fact his first home game was against his hometown club but McEneff isn’t the first to switch to a rival club from Derry City and he won’t be the last. Remember the club’s record appearance holder, Peter Hutton, made his move to Shelbourne in 2001 when he went to Tolka Park and won the league. Liam Coyle left three times for Finn Harps, Coleraine and Glentoran for various reasons but returned and rightly enjoys legendary status for his achievements. McEneff is viewed by some fans as a mercenary or disloyal but can we begrudge a fellow Derry man for wanting to further his career? Absolutely not! McEneff has huge respect for Derry and its supporters. He’s actually a decent guy off the pitch believe it or not. In fact in a typical act of kindness from the player, he made his way across the street after the game to the Maldron Hotel when he got word that two of his biggest fans had come to watch the match. Seven year-old Lennon Nelis and his six year-old brother, Harry from Derry had asked their dad for Shamrock Rovers’ shirts once their favourite player, McEneff made the switch to Dublin and they wore their jerseys underneath their Derry City zip-up tracksuits to the game. McEneff met up with the youngsters in the lobby of the hotel and posed for photographs which made their trip worthwhile. He’s always been the approachable sort and also took time to stand and chat with two disgruntled Derry fans despite having to hurry back to meet up with his parents who had made the trip to watch their son play. His work with the Ryan McBride Foundation and his community work in Derry must not be forgotten either because those charitable traits far outweigh his on-field actions. McEneff was so, so close to signing a new long term deal with Derry last season before having a change of mind at the final hour! And how good would it have been to see McEneff and Barry McNamee lining up alongside each other once more in the red and white. McNamee remember, was subjected to a torrent of abuse from sections of the City support when he returned to Brandywell for the first time in the Cork City colours but now all is forgiven. As I said, it’s a funny old game. It’s a long running discussion but worth pointing out again how many top Derry born players are plying their trade at other clubs around the country with Patrick McEleney, Michael Duffy being two of the standouts at Dundalk and hopefully in the near future the club will be in a position where it can keep its best players. McEneff’s goal just cemented the win for Rovers. It wasn’t of the Denis Law magnitude which saw Man United relegated at the hands of their fierce cross city rivals, or as hard to take as Henrick Larsson scoring for Barca against Celtic, or Luis Figo for Real Madrid against Barcelona. It hurts all the same and it’ll be interesting to see his reception on Foyleside when Rovers arrive on April 19th next.